A moderate Muslim cleric has been shot dead in Mombasa, the latest killing of a preacher in the Kenyan city. 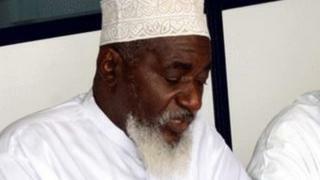 Sheikh Mohammed Idris, chairman of the Council of Imams and Preachers of Kenya, was killed close to a mosque near his home by a group of gunmen. Reports say he had previously been threatened by radical Muslim youths and had said he feared for his life. He is the fourth prominent Muslim cleric to be shot dead in the city since 2012. The others were accused of links to the al-Qaeda linked Somali Islamist group al-Shabab and their supporters accused the government of being behind their killings - charges the authorities denied. Mr Idris had apparently urged the police to deal with militant elements at his mosque, leading some to brand him a traitor. "There was a power struggle at Sakina mosque - where he was supposed to be installed as a sheikh - between his supporters and another radical group opposed to him," Mombasa's police chief Robert Kitur told the AFP news agency. According to Kenya's Daily Nation newspaper, those opposed to him wanted to change the mosque's name from Sakina Jamia to Masjid Mujahedeen, meaning "mosque of Islamist fighters". President Uhuru Kenyatta vowed to "bring the killers to book". "Sheikh Idris was at the forefront in the fight against the radicalization of the youth, and therefore his death is a big blow to the country's efforts to stop religious extremism," he said in a statement. The British High Commission in Kenya has also issued a statement, condemning the killing. In April, Abubakar Shariff Ahmed, known as Makaburi, who had been listed by the UN as a recruiter for al-Shabab, was shot dead in Mombasa. Before he died he had said he supported the group's attack last September on the Westgate shopping centre in the capital, Nairobi, when 67 people died. His supporters blamed Kenya's Anti-Terror Police Unit (ATPU) for his killing. Correspondents say it is not clear whether the ATPU was involved in the shooting but late last year an ATPU officer told the BBC the police had lost faith in the courts and preferred instead to "eliminate" terror suspects. The Mombasa-based group Muslims for Human Rights has said it fears such methods do not reduce radicalisation, but have the opposite effect.